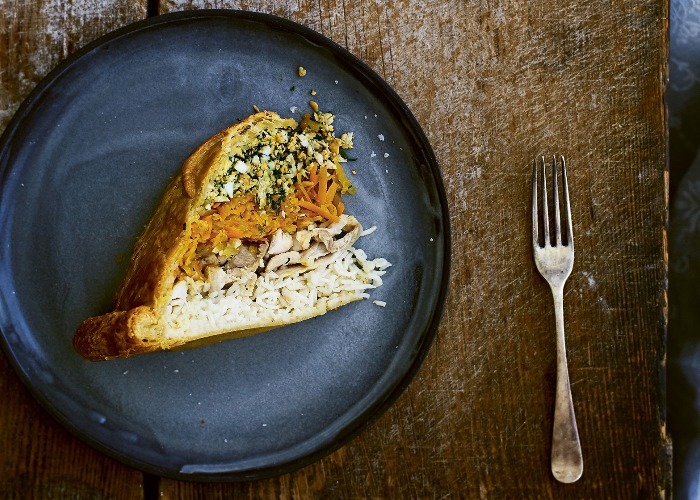 This impressive domed pie is filled with layers of chicken, rice and herby eggs. Traditionally it's enjoyed with a mug of hot chicken broth. First, make the pastry. Pulse the flour, salt and butter together in a food processor until you have a uniform crumb with no lumps of butter within the flour. Add the sour cream and pulse again until the dough starts to form a ball. Tip on to a work surface and gently bring together with your hands. Cut off roughly one-third of the pastry and shape into a disc. Shape the remaining two-thirds into another disc. Wrap both discs individually in clingfilm and chill in the refrigerator for about an hour until firm. Next, cook all the ingredients for the filling. Melt 25–30g (0.8–1oz) of the butter in a large frying pan and fry the onions and carrots with a generous seasoning of salt over a low heat for 10–15 minutes until they begin to caramelise, stirring occasionally. Remove from the pan and set aside. Melt the remaining butter in the same pan and fry the chicken thighs over a medium heat for 6–8 minutes on each side, seasoning with salt and pepper as you turn. If using thighs with skin, make sure to get it nice and crispy. Let them cool slightly before pulling the chicken apart with your fingers – you want juicy bite-sized chunks or strips. Cook the rice in plenty of salted boiling water for a minute or so less than the packet instructions – you want it to be al dente, as it will cook further once inside the pie. Drain and let it cool. Roughly chop the hard-boiled eggs and mix them with all the herbs. Season generously with salt and pepper. Line a large (3 litre/5.2 pints) bowl with clingfilm, making sure there is a bit of overhang around the sides. Remove the bigger disc of pastry from the refrigerator and lightly flour the work surface. Roll out the disc into a rough circle until it’s about 3mm (0.1 inch) thick and use it to carefully line your clingfilm-covered bowl, ensuring there are no air pockets between the bowl and the pastry. Return to the refrigerator while you roll out the smaller disc in a circle to the same thickness. When the filling ingredients are sufficiently cool, remove the pastry-lined bowl from the refrigerator and start layering, beginning with the herby eggs, followed by the onions and carrots, chicken and finally the rice. Make sure you firmly pack down each layer before adding the next, as this helps the pie to hold its shape once you flip it and remove the bowl. Brush the pastry rim with some of the beaten egg (reserve the rest for later) and top the pie with the smaller pastry disc. Pinch together to seal, leaving the overhang. Chill the pie in the refrigerator for a couple of hours. When you’re ready to bake the pie, preheat the oven to 200°C/400°F/gas mark 6. Place a baking tray lined with baking parchment on top of the bowl. Holding the base of the bowl, quickly flip the bowl and the baking tray together so the bowl is upside down on the baking tray. Carefully lift up the bowl and clingfilm to reveal your pie. Trim and crimp or twist the edges, then brush the whole pie with the remaining beaten egg. If you have any dough left over, you can also add some ornate shapes to decorate the pie. Use a knife to cut a cross in the top to allow the steam to escape. Bake for 1 hour 20 minutes or until golden brown and a metal skewer inserted into the steam hole comes out hot. Bring the whole pie to the table and enjoy.